This delectable new journey, led by a passionate local foodie, lets you eat your way through Russia’s greatest cities, Moscow and St. Petersburg, while taking care to touch on all the definitive cultural sites. Explore the enduring open-air markets, the czarist and nouvelle cuisine restaurants, retro Soviet cafés and vodka bars and meet famed chefs for hands-on cooking classes. Plus dine in a country dacha, where home-cooked cuisine and traditional Russian culture come together. This journey promises to take you beyond borscht into the depths of Russian cuisine, Vodka included. No reviews yet for this trip. Browse other reviews below for MIR Corporation. Attend a master cooking class at Moscow’s Taste of Russia, where expert chef/instructors lead a hands-on lesson in purchasing and preparing classic Russian dishes; then dine together on your creations. Take a cook’s tour of Moscow, dropping in at the lavish pre-revolutionary Eliseyevsky food store; the canteen at John the Baptist Convent, where the nuns make the best bread in town; and Perlov’s Tea House, to learn about the history of tea- drinking in Russia. Sip Russia’s premium vodka, Crystal, on a private tour and tasting at the Cristall Vodka Museum. 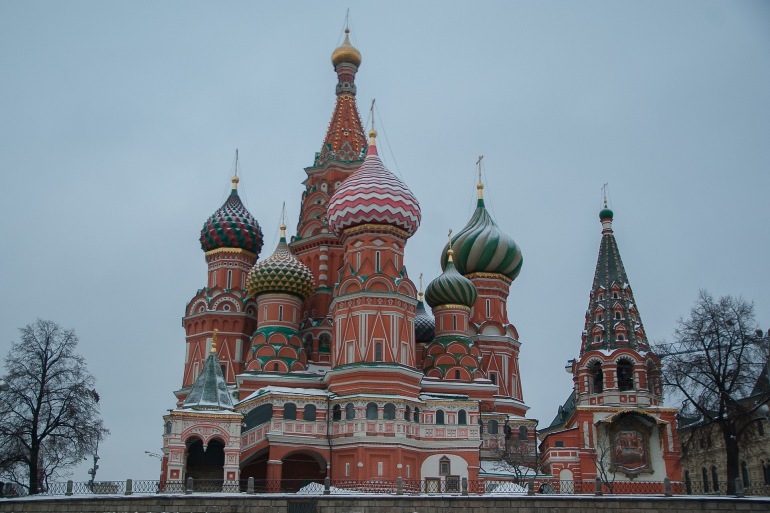 And of course, explore UNESCO-listed Red Square and the Kremlin. Admire the UNESCO World Heritage Site of 18th century St. Petersburg, Peter the Great’s summer palace, and beautiful blue Catherine’s Palace. Meet a St. Petersburg celebrity chef and take a class with him, preparing traditional Russian specialties. Indulge in some Soviet nostalgia with an exploration of Ryu Moch Nii, vodka bars for the workers. Sample kvas, a popular Russian drink with ancient roots made from fermented brown bread, and dine in places that Dostoevsky and Gogol might have eaten. Venture to an organic farm that supplies LavkaLavka, a modern whole-foods collective, with some of their products. And enjoy a festive home-cooked dinner at a dacha in the company of its St. Petersburg owners. 9 breakfasts, 7 lunches and 7 dinners per the itinerary. Transportation throughout itinerary by private vehicle (type of vehicle depends on group size). Customized visa application and instruction kit. A few lunches and dinners are not included so that you may enjoy a chance to experiment on your own. International airfare is not included in the land tour cost. Visa fees are not included in the tour price.